Swissport and the French Derichebourg SA have announced they have signed a definitive agreement under which Swissport will acquire Servisair from the French Derichebourg SA. Swissport says it has already secured appropriate financing for the acquisition. 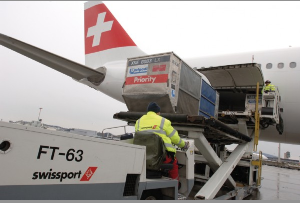 Swissport adds that by combining the two companies, the new group will enable it to: �continue improving its worldwide service offering to customers.� A company statement says the acquisition has been unanimously approved by the boards of directors of both companies and is subject to merger clearance by the competent merger control authorities. Servisair currently provides ground handling, cargo, fuelling, load control and airport services at 118 stations in 20 countries. Total revenue of Servisair in FY2012 was �688 million (US$909m) earned with a workforce of about 15,000 staff. SEATTLE. 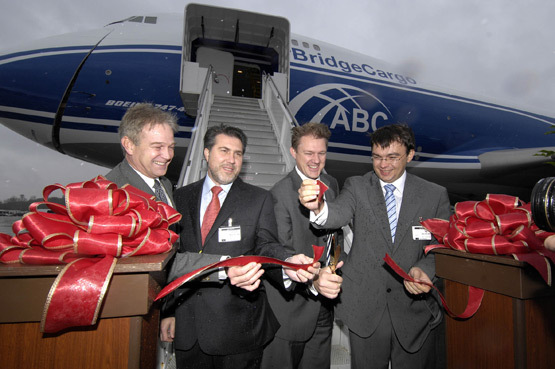 Russia's largest scheduled international cargo carrier, AirBridgeCargo Airlines (ABC), part of Volga-Dnepr Group, has today taken delivery of its first Boeing 747-400ER Freighter, representing the next stage of its strategic development. Boeing formally completed the delivery of the first of three B747-400ERF aircraft ordered by Volga-Dnepr Group in a special ceremony for AirBridgeCargo and Volga-Dnepr executives at The Boeing Company's headquarters inSeattle. The aircraft will join the ABC fleet under lease from GE Commercial Aviation Services (GECAS). The new aircraft takes to six the total number of Boeing 747 freighters in the AirBridgeCargo fleet, which already includes -200F (4) and -300F (1) versions. ABC's first commercial flight with the ERF aircraft is scheduled from Hong Kong to Russia on November 19th 2007. Commenting at the aircraft handover ceremony in Seattle, Denis Ilyin, ABC's Senior Vice President, Strategy & Commercial, said: "This new aircraft will enter service on our routes from China and enable us to increase service reliability, achieve operating efficiencies and extend our winter schedule ex Asia to seven flights a week from Shanghai and Hong Kong. "The Boeing 747 is a great cargo aircraft and the long-range, highly efficient operating capability of the -400ERF will enable us to continue with our strategic development into new markets. Following the delivery of our second aircraft from Boeing in February, AirBridgeCargo will commence services to and from North America and Europe via Russia, further establishing ABC and Volga-Dnepr Group as a worldwide company. Our US and Canadian operations will increase further in April when the third -400ERF joins our fleet." Craig Jones, Vice President of Sales for Russia and Central Asia, Boeing Commercial Airplanes, said: "This is a milestone for Boeing to deliver our first new 747-400 Freighter to Russia. AirBridgeCargo clearly sees the reliability, efficiency and value of the industry standard 747-400 Freighter in today's cargo market." Volga-Dnepr Group's commitment to the Boeing 747 family of aircraft extends beyond the three 747-400ERFs. In March 2007, Alexey Isaikin, President of the Group signed a contract with Boeing for five brand new long-range Boeing 747-8 Freighters plus options for five more of this next generation cargo aircraft. These freighters will join the AirBridgeCargo fleet between 2010 and 2013. 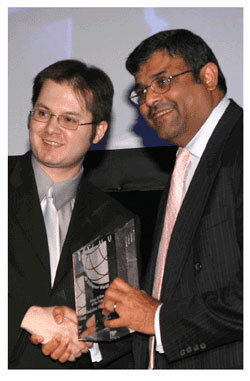 Photo:Ram Menen (right), Emirates Divisional Senior Vice President, Cargo, accepts the "Cargo Airline of the Year" award from Air Transport World Senior Editor Aaron Karp (left) at the 2007 Airline Industry Achievement Awards gala. DUBAI, U.A.E. Emirates, one of the world's fastest growing international airlines, has been awarded "Cargo Airline of the Year" by the editors of Air Transport World, a leading monthly magazine serving the global airline industry. "Emirates is delighted to win the esteemed ATW Cargo Airline of the Year award and be recognized by experts in the airline and cargo industry," said Ram Menen, Emirates Divisional Senior Vice President, Cargo. "At Emirates SkyCargo, we have aimed to achieve the highest standards of product quality and customer care. We are honoured that Air Transport World has identified us as one of the top airlines that has characterized itself through outstanding performance and service."